Every great single-cylinder motorcycle has inspired fantasies of doubling the jugs to make a V-twin. 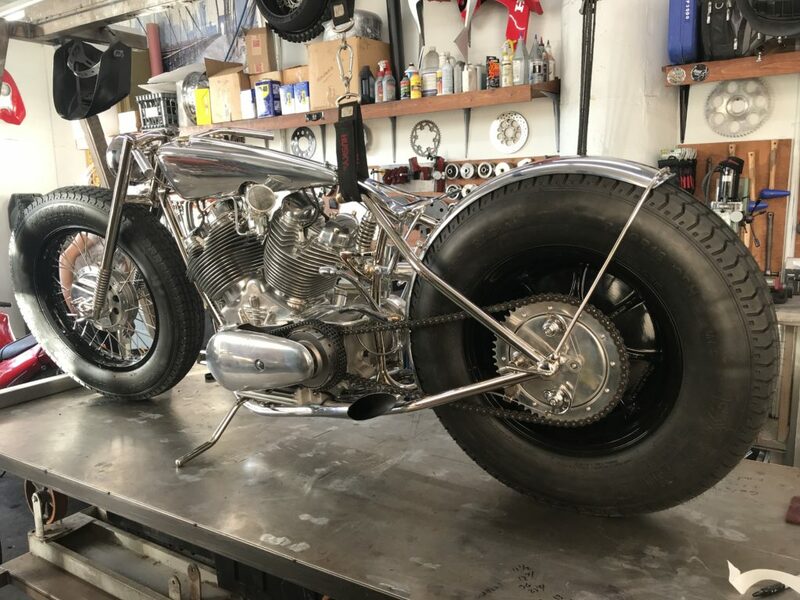 It’s a very old story, as both Indian and Harley-Davidson tried it (hello), and plenty of customizers have done the same over the years; there are V-twin Velocettes (the Vulcan), Rudges, and even the odd Norton. 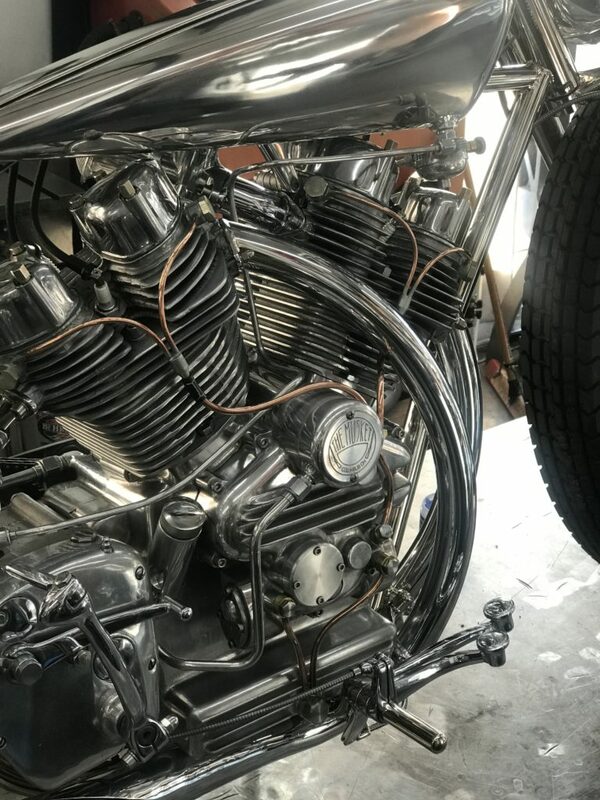 Ohio’s Aniket Vardhan not only sorted how to make a V-twin Royal Enfield (the Musket) using mostly original parts (barring the crankcases of course), but has series produced the motor for a few lucky customers. 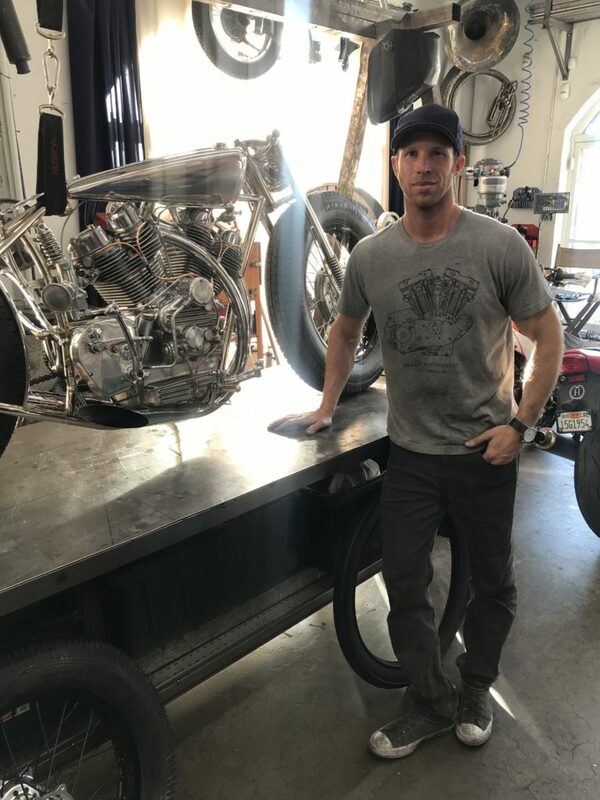 Celebrated custom builder Maxwell Hazan of Los Angeles ordered two of the current batch of seven Musket motors, and he’s just finished his second Musket custom, as seen in a chance visit to his workshop in downtown LA last week. Max Hazan rapidly fixed his star in the custom motorcycle firmament, as his design sense is impeccable. 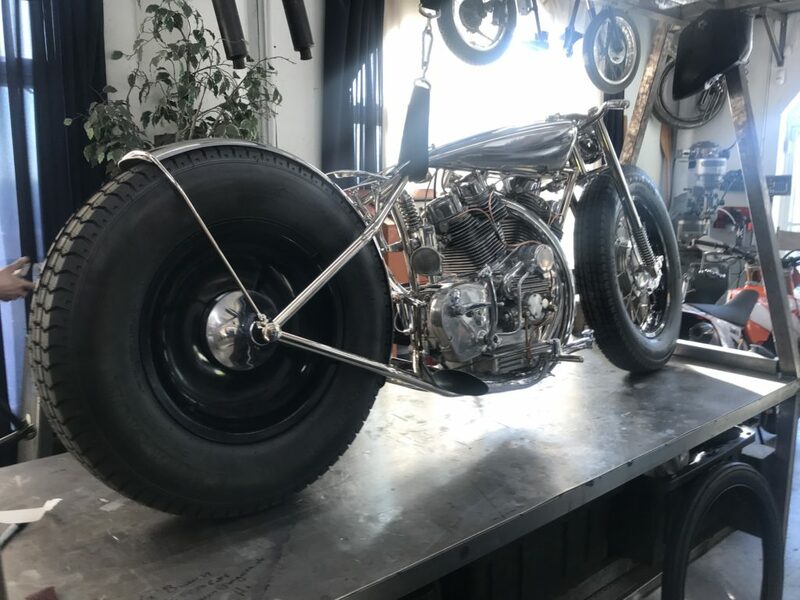 Hazan’s engineering, on the other hand, is polarizing; the dramatic, clear lines of his ‘silver machines’ catch they eye, but freak out engineers, who worry about that delicate tubing and its robustness in real-world riding situations. But Hazan does consider tubing strength, and finds clever solutions to the various demands placed on his chassis. He’s known to vary the wall thickness of the tubing he uses for frames and forks according to the loads they’ll face, so while a part might look unbelievably delicate, it might just weigh a ton, as he’s been known to use 1/4″ wall thickness at times; the go-to pipe of plumbers! 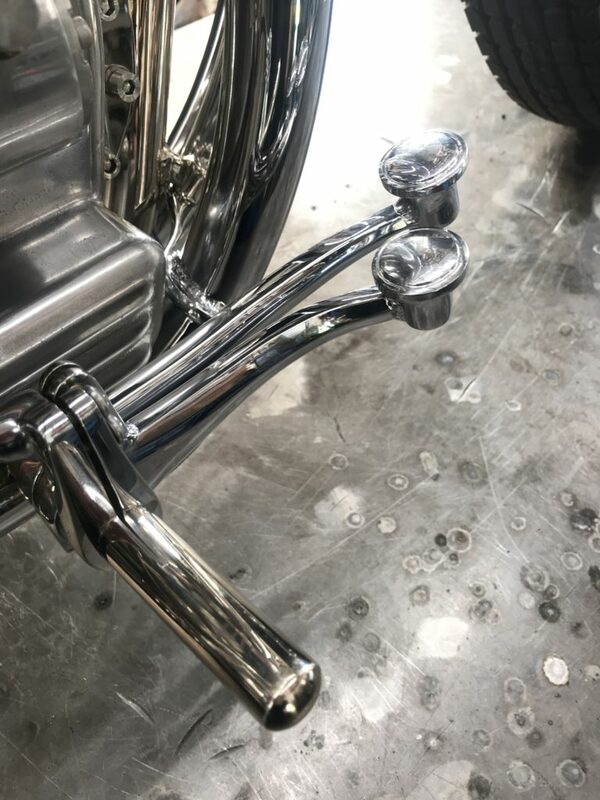 Hazan is stretching his engineering chops in other areas of the chassis, including clever touches like the combined handshift/clutch lever on the rider’s left side, and the dual brake pedals on the right. Those cool elements free the handlebars from clutter, and the Musket 2’s bars are admirably clean, with internal twistgrips and metal handgrips giving a nearly flush, curved line from side to side. The front forks are Hazan’s own design, and ‘upside-down’ with springs near the axle. 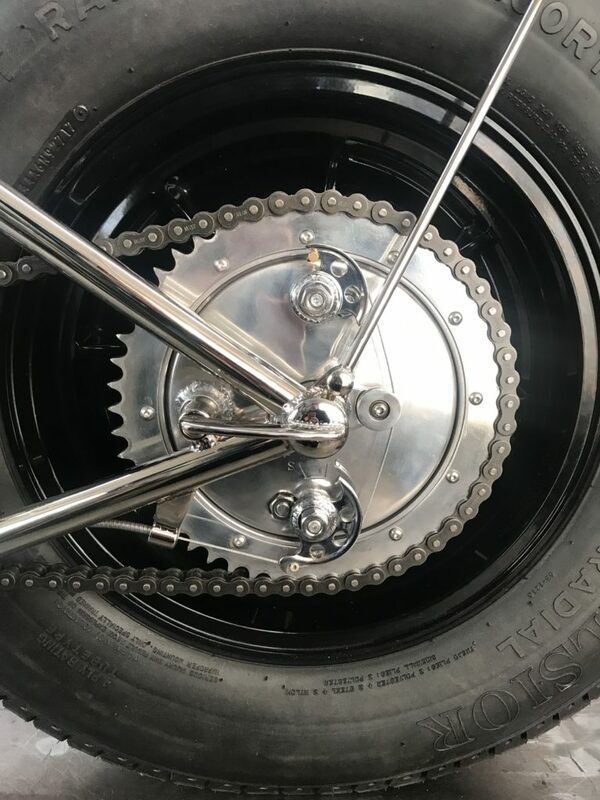 The brake plate anchor visually counterbalances the leading-axle bottom fork lug, while it’s mirrored on the other side of the hub by a faux brake plate that directs cooling air via a scoop into the brake drum. Very snazzy, and a motorcycle part I’ve never seen. While the front wheel has a spoked drum, the rear wheel is a solid mag sourced from an automotive catalog. Painted black, it gives a masculine solidity to the back end, and takes a car tire of course, which has become something of a standard for Hazan’s builds. 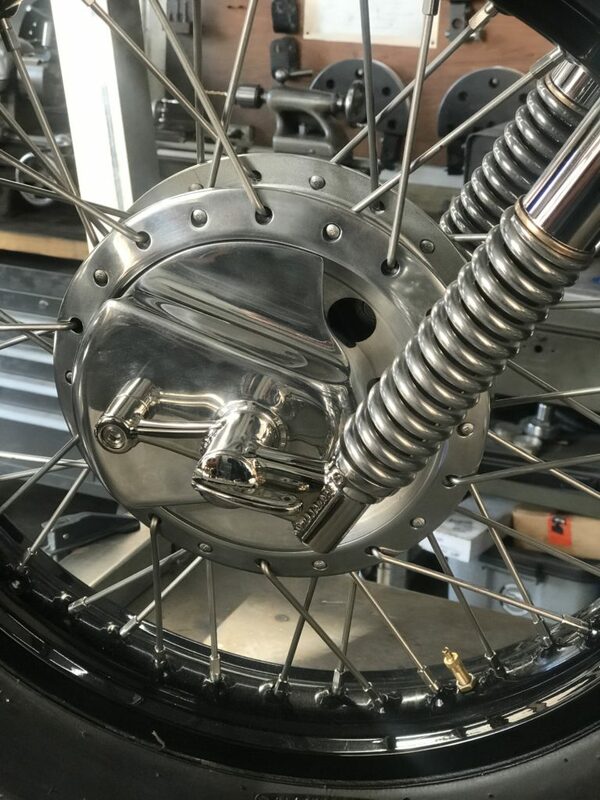 The rear brake plate has two clever cams worked by a cable, and the smooth, featureless transition with the brake drum, as well as the lovely forward-facing brake plate anchor, is beautifully balanced. Hazan is fond of very slim saddles, sometimes with wooden tops; he wanted to explore stretching leather over the aluminum seat frame in this case…but the client wanted wood! Such is the price of having a signature seat. The saddle pivots on its nose and is sprung by a bicycle shock. 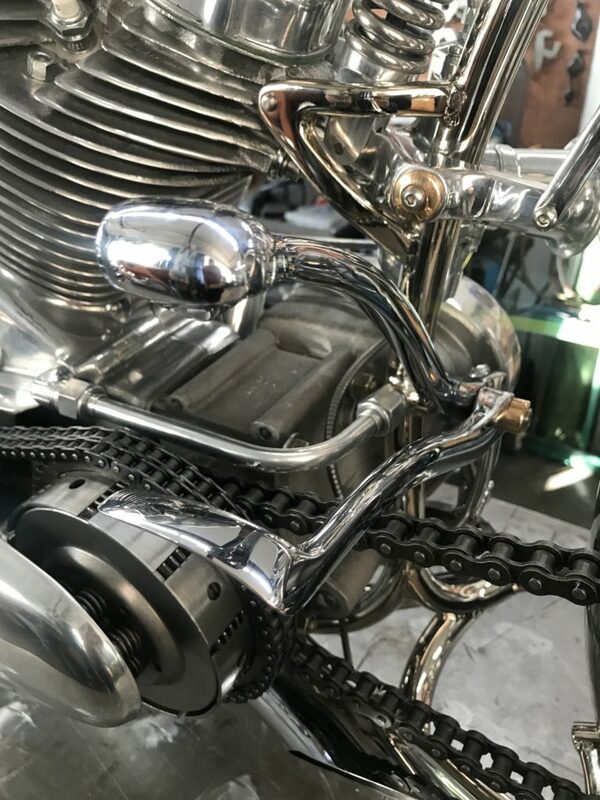 That compensate’s for the rigid frame, which has an uninterrupted line from the rear axle to the headstock, free of distractions like struts or gussets, just clean lines and curved silver tubes. Would the frame hold up to regular usage on LA’s rough pavement? No, but this bike isn’t built for such use; it’s a design exercise that functions, and an artistic statement in the shape of a motorcycle. The fuel/oil tank is a softened wedge shape and does triple duty, hiding the voltage regulator in its nose as well, with a funnel-shaped porthole directing cool air at its finned body. The scale of the tank matches that of the headlight, making for a unified top deck, and a very basic silhouette for the whole machine: wheels, frame, engine, tank/light. The masses are so very reduced the bike is almost cartoonish, but any further examination beyond the basic outline reveals the seriousness of Hazan’s intention. He’s following his own star, and this is the kind of machine we can expect. Long may it continue; his work is a welcome respite from same-same production bikes, and the heaps of unclever customs flooding our inbox. All very slick, but why waste a working rare motor in such a build? These motors need to be run and used to put in the miles; an empty set of castings would have done the job nicely for an “Art” piece! But then I’m no Bohemian, hipster, just a bearded, retired, motorcyclist who enjoys the breeze! Thoroughly enjoy the Blog, please keep putting these pages together. I disagree. I don’t think Kimura. Narita, et al come close to having the same vision and skill set that Hazan does. Just my opinion. Actually, I have never been a fan of Kimura’s designs, although I appreciate the time and effort he puts into his builds. 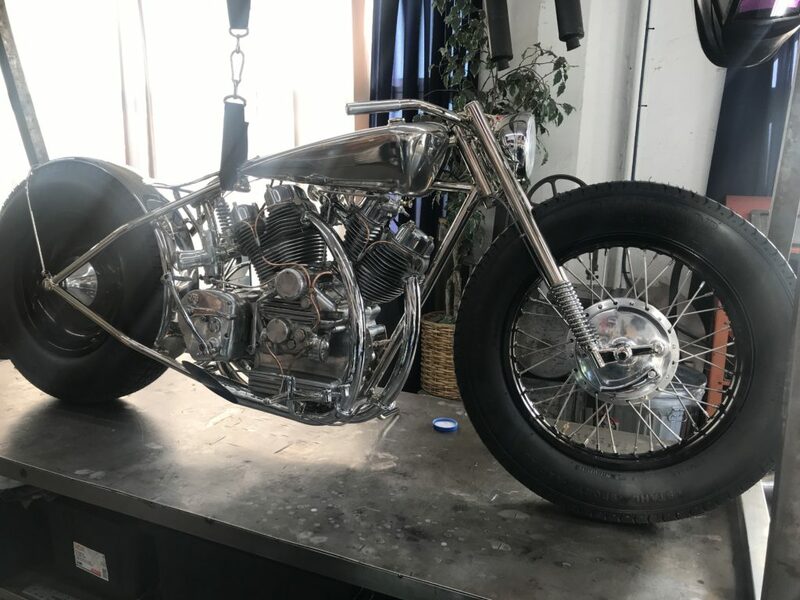 I spent a few moments talking to Aniket Vardhan at the Mid-Ohio vintage bike event a few years back while admiring his first home-built Musket V-Twin. Interesting guy and very cordial. Beauty is in the eye of the beholder, ’tis true. But, I like to ride. This vehicle scarcely seems fit for riding. What do the owners of these do with these sort of things? Can they even be licensed to ride on public roads? Max seems able to ride and license his creations . Check out Bourdain’s Raw Craft episode on Max and his bikes available on YouTube . Suffice it to say the majority of Max’s customs are not exactly daily riders nor are they intended to be . But then again . What genuine ground up customs are ? In regards to licensing … that all depends on which state/country you’re in . As far as the owners are concerned . Once again that depends on who the owner of any given custom is . e.g. Some ride the hell out of em .. some just look at em and show em . A little advice .. quit over generalizing , get over yourself and your self imposed restrictions and simply enjoy the ride . 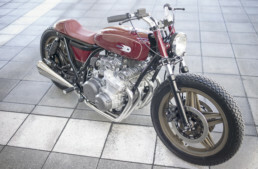 Or at the very least revel in the craftsmanship and creativity that goes into full blown ground up custom M/C’s such as this .